History can be a jumble of facts, names, places, and dates. But, history can have tremendous personality too. The people that had profound impact on the shaping of American history are taught to us in school, often without the personality to go along with the name. 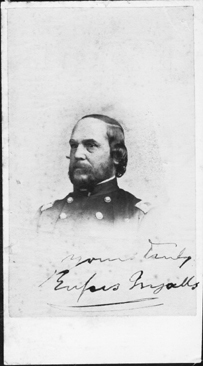 Rufus Ingalls was, at one time or another, associated with a suprising number of the names and places that formed the United States as we know it today. I found his story to be a very interesting one and hope you will too. The story of Rufus Ingalls starts in a small village in the foothills of the White Mountains and includes places such as New Mexico, California, Oregon, Utah, many battles of the Civil War, Appomattox, New York City, and the White House in Washington. When he was born in 1818 Maine was still part of Massachussetts and Illinois was the 'West.' At the time of his death in 1893 all the places he travelled in his days as a young army officer were stars on the flag. The people he encountered during his lifetime include names that everyone knows. US Grant, George Pickett, Brigham Young, William Techumseh Sherman, and James Longstreet to name a few. When he is mentioned by someone, it is always complementary. Rufus had a strong devotion to duty and his friends. This web site is organized by time period and place. As with everything, it is best to start at the beginning but I have tried to make each 'chapter' as self-contained as possible, so you should be able to jump in at any point. The timeline will give you an idea of the major events during his life. Generally, the references used in the creation of this web site are in the public domain.